We’ve redesigned PubChem’s homepage to give you easier access to the information you need, where you need it. The mobile-friendly, responsive design works on the device you want to use. And the streamlined, intuitive interface puts the data you need at your fingertips. The menus at the top of the page and the sidebar have been replaced with a minimal set of important links. These links include “About,” “Blog,” “Submit,” and “Contact.” The “About” link will bring you to the PubChem Docs site, where you can find an exhaustive list of PubChem services and documentation. In addition, data count and data source statistics have been highlighted. Each also includes a link you can follow to get more information on these statistics. Finally, we’ve improved PubChem’s search capabilities. The three search boxes for compounds, substances and bioassays have been replaced with a single search box that covers all search types. 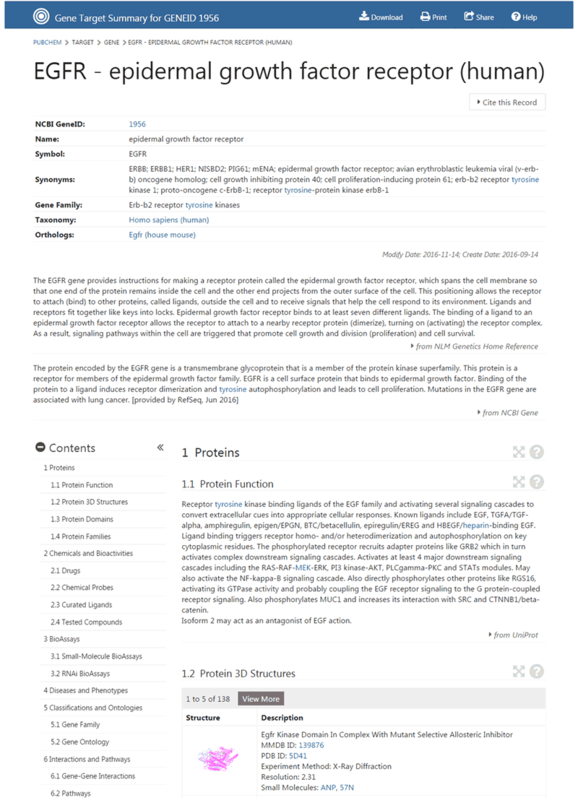 Search results from the formerly separate search types (compound, substance, and bioassay) have also been integrated into a single search results display. 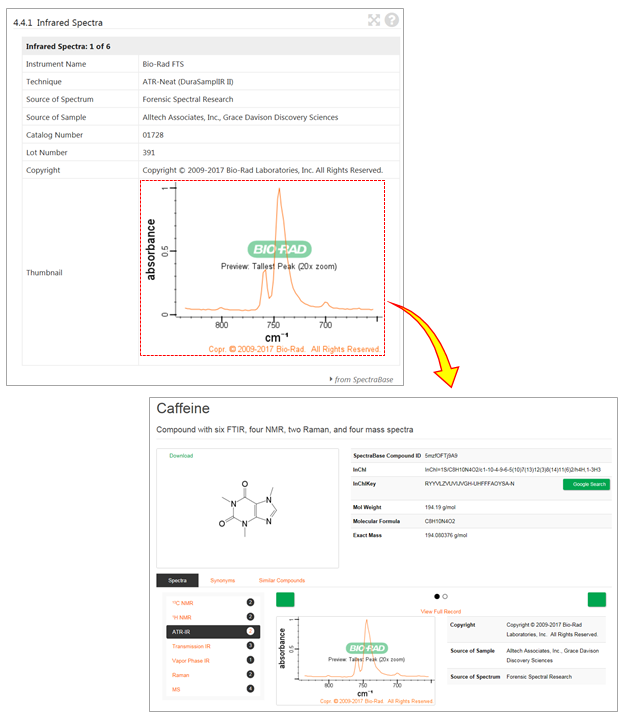 In addition, search in PubChem now directly supports formula and structure search. We have many more details to share with you about the new PubChem search in a separate blog post, so keep your eyes open for that! PubChem’s new look and feel is a big step forward for PubChem, and we’re excited to share all of the improvements we’re making across PubChem with you! Stay tuned to this blog for future announcements about the roll-out of all the new designs and features coming to PubChem! 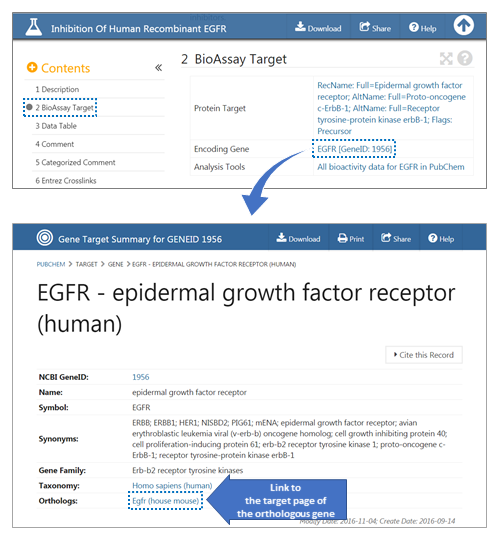 We’ve redesigned PubChem’s summary and record pages with a series of updates both behind the scenes and to your own user experience. These changes will make finding the information you’re looking for easier and faster. Behind the scenes, we’ve changed the way PubChem models and serves information. Most people won’t see these changes, but the changes do allow us to create pages better suited to your needs, faster. If you’re a programmatic user and you need information on how the data model changes affect you, you can find more information in our blog. To go along with the behind the scenes changes, we’ve redesigned your user experience with an all new look and feel. To begin, we’ve started color-theming our pages to make it easier to recognize what kind of page you’re on. For example, compound pages may have a light blue theme, while substance pages a yellow theme. There will be themes for bioassay and other page types as well. We’ve also looked over volumes of usage data and user feedback to improve page layout and navigation, and many of the changes you’ll see are a direct response to your feedback. For example, the table of contents has been moved and improved. It now appears on the right side of the page, and higher up on the page. Redundant navigational icons are being removed. Another result of your feedback is that we’re emphasizing chemical safety information in the summary area at the top of the record. We’re also adding thumbnails for all the available structure types of a given compound (for example, 2D, 3D, crystal) to the summary area. In addition, the graphics quality of the compound 3D Conformer interactive model has been significantly improved. No more HTML markup within strings; instead, we will have an explicit markup object that separates primary strings from the various markup types. All values are lists, having separate fields for individual values. No more embedded tables in the data blobs. No more HTML markup within strings. This new format will make it easier for parsers to get at the relevant text data without a lot of programming overhead. Please note that this removal of embedded HTML also includes escaped entities in HTML. These will instead be represented by a single UTF8 character (for example, “&deg;” à “°”) within the base string. These changes will make it easier to code your data parsers. These changes will make it easier to retrieve data from tables without a lot of programming overhead. In summary, PubChem’s new data model makes it easier to retrieve the data you need. As the data model is updated and released, you’ll be able to find detailed information on the schema here: https://pubchemdocs.ncbi.nlm.nih.gov/pug-view. 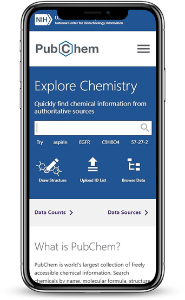 The Thieme Chemistry information in PubChem covers nearly 700,000 chemical substance records, nearly 700,000 scientific article descriptions, and over 1.2 million links between chemicals and articles. The document descriptions include information such as a digital object identifier (DOI), publication title, name of the journal or book, publication type, language, and publication year. The Thieme Chemistry contribution dramatically increases the number of chemical structures in PubChem with links to the scientific literature from nearly 1.0 million to 1.6 million. Of the approximately 700,000 Thieme Chemistry chemical structures contributed to PubChem, 42% are new to PubChem, and 89% previously lacked literature links. 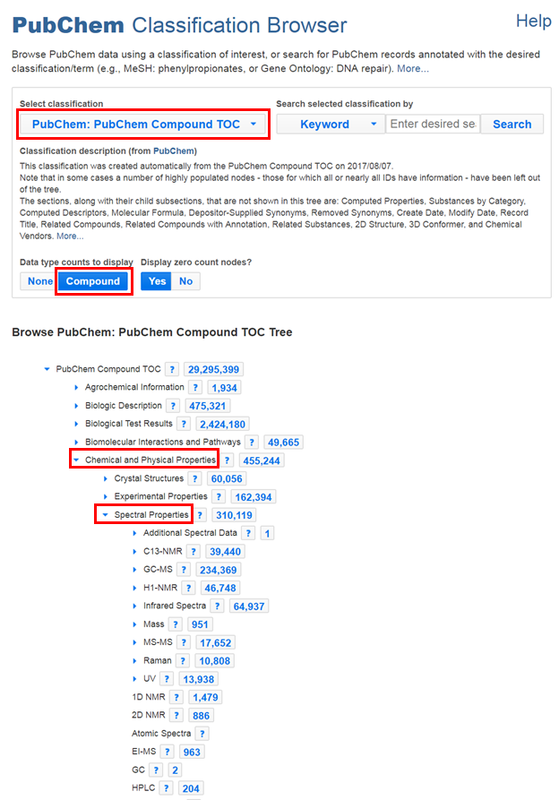 Within the PubChem Classification Browser, the PubChem Compound TOC (Table of Contents) classification tree allows you to find all chemicals with a given annotation section. You can click “Literature” to view the subset fields under literature and find the “Thieme References” section. Clicking on the number will then show compound records with that section. The entire list of chemical substances provided by Thieme Chemistry is also available through the PubChem Data Sources page. (Read this blog post to learn more about the PubChem Data Sources page.) Searching for “Thieme Chemistry” from the list of data sources shown on the page will lead you to the Thieme Chemistry data source page that has a link to the PubChem records provided by Thieme Chemistry. You can also search the PubChem Compound or PubChem Substance databases directly using the query “Thieme Chemistry”[sourcename]. Each chemical record with a Literature / Thieme References section includes a table containing document links from Thieme Chemistry. The figure below shows the Thieme References section of the Compound record for ciprofloxacin (CID 2764). Figure 1. The Literature / Thieme References section of the ciprofloxacin Compound record (CID 2764). Clicking the title (red circle) loads the article at the Thieme Chemistry site. The article title links to the article on the Thieme-Chemistry site. You can download all references for a chemical record in CSV format through the “Download” button at the top right of the table. You can also expand to the full table by clicking the icon, where you can see additional data columns. 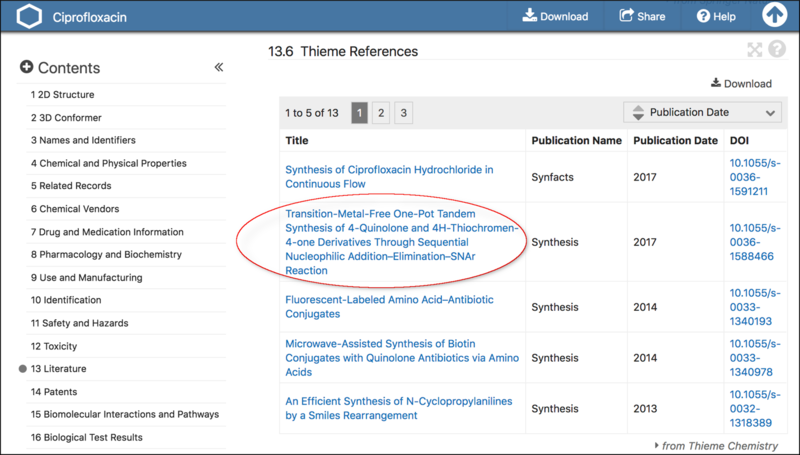 By default, the articles are ordered by Publication Date as provided by Thieme Chemistry, but you can easily change the sorting order through the pulldown menu. 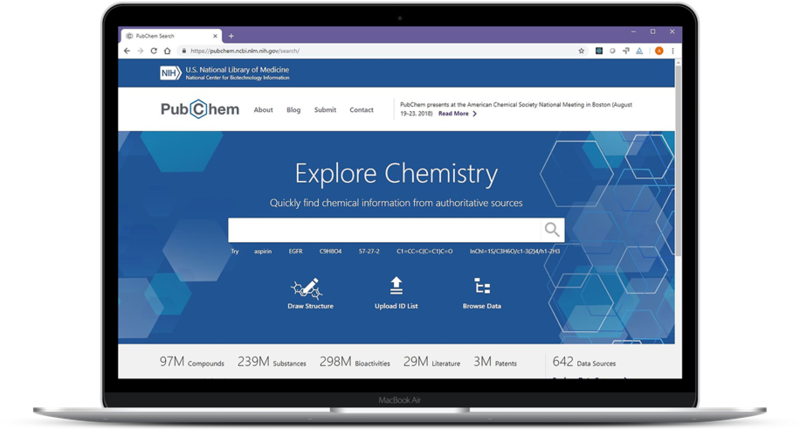 PubChem, along with contributors such as Thieme Chemistry, is helping to fuel a modern, data-driven research ecosystem. Literature links from Thieme Chemistry dramatically expand the findability, accessibility, interoperability, and reusability (FAIR) of synthesis-related chemical information. In addition, this contributed content helps to further enhance global open science by allowing researchers to locate key information about chemicals. PubChem BioAssay Tools (https://pubchem.ncbi.nlm.nih.gov/assay/assay.cgi), a legacy collection of bioactivity analysis services, are being retired as part of an on-going technology refresh. Alternative approaches now exist to perform most of the same tasks, and these newer technologies provide expanded features and capabilities. The PubChem BioAssay Tools services will be no longer accessible after November 1, 2018. Why are we phasing out the BioAssay Tools? The BioAssay tools were developed when PubChem was much smaller. At PubChem’s current size, the tools do not scale sufficiently to handle most analysis tasks. Consequently, many users download data for use in their assay analysis workflows instead of using the tools. Deprecating these BioAssay Tools will free up resources allowing PubChem to develop new and better approaches to accessing bioactivity content. What replaces the BioAssay Tools? Though some tools (like Structure Clustering and Structure-Activity Relationship Analysis) do not currently have direct alternatives in PubChem, most PubChem pages indicate related records such as structurally similar chemicals or assays performed against a given target. They can be further aggregated using commonly available third-party tools. Will my old link work to the BioAssay Tools? URL redirection from BioAssay Tools to their corresponding replacement will be provided for a period beyond November 1, 2018. Eventually, the redirection links will be removed.